Server is dedicated to synchronize network devices own local time/date to UTC. Devices synchronizing own local time through the NTP V3 protocol. By this way GPS Time Server is connected to atomic cesium standard nist.datum.com over the GPS satellite system. Built in WEB page for status monitoring, setup the network values. NTP Ver3 supported in Client - Server mode, NTP Broadcasting supported also. SNMP traps production on every lost of UTC FIX status. Ethernet connectivity 10baseT, RJ45 connector. 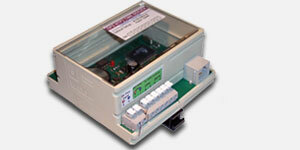 The main electronics is placed in-to the DIN Rail case, suitable to mount in server rooms. Powered from external DC power source 9..24V GPS receiver with antenna are placed outdoor in waterproof case IP-65. Connection between GPS receiver and server is made through the standard TP twisted pair cable. Max cable length is 100m.